Well folks that’s 18 months of See The Invisibles, wow what can I say, Its blown me away, the generosity of people in and around Glasgow and even as far as the Shetland isles, donations at football grounds, donations posted from hundreds of miles away, people going on to the Amazon wish list and buying stuff to give to our group to pass on, we as a group hope we have helped a lot of people or at least made their life a wee bit easier. 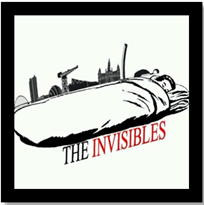 The Invisibles started with a blog then a meeting or two, I was told by an experienced social worker that this could be big…well I thought no more of that statement, but I have since told that person how right he was, and it’s all down to ordinary folk who help the group and hold down jobs as well, donors who never seem to stop amazing me. It’s 2015 and we still have the problem of homelessness and people having to use foodbanks, it’s not right. Well we have done T in the park again and a special thanks to Tangerine Fields for their help and donations of sleeping bags and a special thanks to all the people who volunteered to wash the sleeping bags, thanks to the folk at our storage unit for helping us out. I’d like to thank the volunteers of our wee group by name…but they want to remain invisible, you know who you are…THANK YOU from the bottom of my heart.